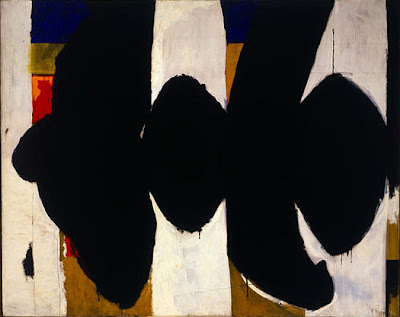 Motherwell was perhaps the youngest of the Abstract Expressionists; he was also their intellectual light, the most educated member of the group, the best travelled and most independent and the artist who was the most connected to the old European avant-garde. He immersed himself in modernist tradition. He especially loved French culture: I imaged that he smoked Gauloises (he did not, he liked the blue label and used it in his collages); he loved French literature: Mallarme, Rimbaud, Lautreamont, Proust and Baudelaire. His contact with surrealism was very important because it prompted Motherwell to paint and involve himself in developing his own for of automatic drawing and painting exercises, firstly with the artist Matta and then with Jackson Pollock. Elegy to the Spanish Republic No. 34 1953-54.
working as “general metaphors of the contrast between life and death and their interrelation" (Lynton, N., 2003 p. 243). 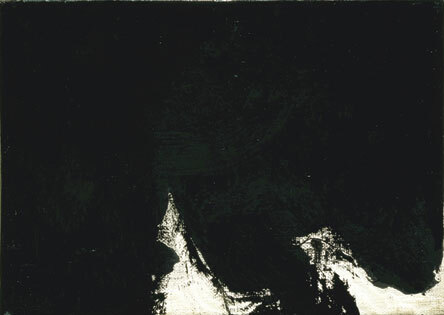 Many of Motherwell's paintings rely on oppositions. He uses "the polarity between amphousness and geometry" to evoke "both opposition and ultimate harmony, as between nature and culture, emptiness thought, passivity and action- and on a larger scale, between chaos and cosmos" (Flam, J., 1991, p. 26-27). 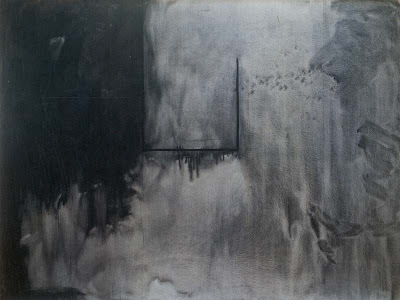 Paintings like Plato's Cave "seem to set emptiness against the mark of man (sic) in a way that recalls the oldest paintings known, those on the walls of prehistoric caves, especially the mysterious and moving pictographs on the walls of Lascaux and Altmira" (Flam, J., 1991, p. 27). Paintings like Summer Open are a manifestation of Motherwell's engagement with Matisse and matisse at his most sensual. The blue seems to reflect the light of Collioure, but a Collioure that this now a lost paradise, part of a Mediterranean culture that has vanished. Is it a nostalgic longing that we see in some of Motherwell's pieces? Lynton, N., (2003) The Story of Modern Art, London and New York: Phaidon.